Thanks to Glen Ward for pointing us to this great piece on the life of John Hobby. An excerpt is provided below, but go here for the full online version – or you can download the PDF file here. For a man who never played Sydney football, John Hobby had an amazing 17 year career. He toured New Zealand with NSW Country in 1968, as well as representing Country Seconds four times, playing six matches against International touring teams, representing three divisions in a total of 30 plus games, playing for four Country Groups and winning six Premierships as a captain/coach. Highly respected by his team-mates and opponents alike, John gave back plenty to the game he loved after his playing career had finished. 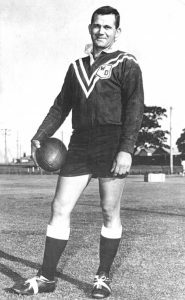 Born at Coolah on 24 July 1938, John attended the local primary school where he began playing Rugby League in 1946. After leaving primary school, he made the 110 kms south journey each way, five days a week, to study at Mudgee High from 1952 to 1954. In 1952 he was forced to give football away after being kicked in the head by a mule at a circus. This resulted in a fractured skull and for most people, football of any kind would never be considered. But he began playing again with the local under 15s in 1953 and the under 18s the following season. at Dubbo. He also gained his first selection for Country Seconds in 1960. Bathurst Railway made the Group 10 Final in 1960 and the semi finals in 1961 and John played strongly in both games. In 1962 he began the first of four successive seasons as Eugowra captain/coach, winning the minor premiership, but going down in the Grand Final. As this was his first captain/coaching job, John made himself unavailable for any representative selection. For the next three seasons, 1963 to 1965, Eugowra won the Premiership and John represented Western Division each season, as well as playing with Country Seconds in 1963 and 1964. In 1963 he also played for Western Division against New Zealand at Parkes and in 1964 played his second international against France, when Western Division won 17-11 at Orange. Newcastle was his next port of call in 1966 and here he was signed to captain/coach the Western Suburbs Rosellas for four seasons. Success was immediate and the Rosellas won the 1966 Newcastle major and minor premierships, defeating Cessnock 31-9 in the Grand Final with John scoring a try and a goal. In 1967 Wests were again minor premiers but were pipped 13-11 by Norths in the Grand Final. Minor premiers again in 1968, the Rosellas won the pre-season competition but were defeated in the final. In another grand final in 1969, Wests were beaten by Lakes United. While in Newcastle, he represented Newcastle against Great Britain in the unlucky 5-2 loss at Newcastle Sportsground on 13 June 1966. In this game he won the trophy for the best forward in either team. The next season he again represented Newcastle, this time in the 14-7 victory over New Zealand. He also represented Newcastle in the Country Championship in each of his four seasons. NSW Country toured New Zealand in early May 1968 and John was a member of the team. Coached by Brian Carlson (23 Tests) and captained by Billy Bischoff, who was then playing with West Tamworth, the Country boys had to play three tough matches in four days. On returning to Sydney, John captained Country Seconds against City Seconds. Tumut was his next destination and he captain/coached the locals to the Premiership in his first season, 1970. The same year, on 24 June 1970 at Robertson Oval Wagga Wagga, he played for Riverina in their tight 12-11 loss to Great Britain. Tumut were runners up in 1971 and 1972, but in 1973, John won his sixth Premiership from 12 seasons as a captain/coach. He remained captain/coach of Tumut until the end of the 1976 and then retired. He worked as Tumut’s non playing coach in 1980 and then served as a group 9 selector for three years from 1982 as well as Riverina Divisional coach in 1984, when they were runners up in the Country championship. For the next six years he continued to work in Rugby League, serving as a member of the Group 9 management committee, a Country RL selector, a senior Group 9 vice-president, Tumut club president and a member of the referees’ fees committee. During his long and successful career, John had several lucrative offers from Sydney clubs, but as a true son of the bush, he rejected them for life in the country. While coaching at Eugowra, he met his future wife Jennifer, who was a local nurse. They married in 1966 and a team-mate from the Eugowra Premiership teams, international second rower, Barry Beath (1965 and 1971 Australian teams to New Zealand) was best man. When John signed with Tumut he and Jennifer and their two sons David and Matthew settled down in the Riverina town. A few years later, daughter Gina was born and for many years, Gina and her husband, Daniel, have been involved with the Tumut RLFC. While Rugby League was always his top priority, over the years John worked as an electrician, a contract harvester, a bricklayer and tiler, and at Tumut, he was a truck driver. He left his mark on all the towns in which he coached. There is a mural of him, Ian Walsh and Barry Beath at the Eugowra Central Hotel, while at Newcastle he was named in the Rosellas Team of the Century. In Tumut, the locals enjoy watching football from ‘the John Hobby Hill’ at the local ground and in 1995 a John Hobby Memorial Foundation was created. At his place of birth, Coolah, a large granite plaque, denoting his extensive playing record, is fixed at the local football ground. In his later years, John enjoyed fishing and lawn bowls, while he also spent a lot of time on his vegetable garden. In the early 1990s, John was diagnosed as having a brain tumour. Showing his typical courage and grit, he battled this for almost a year before passing away on 30 November 1991 at Tumut, aged just 53.